There exists a form of power and intelligence that represents the high point of human potential. It is the source of the greatest achievements and discoveries in history. It is an intelligence that is not taught in our schools nor analyzed by professors, but almost all of us, at some point, have had glimpses of it in our own experience when we work intensely on a project or under a deadline — under pressure to get results, ideas seem to come to us out of nowhere; we feel more mentally active and creative. These powers are something that great masters in all fields experience over long periods of time, and it comes to them through a process of learning and experimentation. It is a path that all of us can follow. I discovered the elements of this process after some twelve years of intense study of powerful people and high achievers whom I wrote about in my first four books. In going deep into their stories, I could piece together details that transcended their fields and indicated a universal pathway to power. Many of the figures I had studied were mediocre students; they often came from poverty or broken homes; their parents or siblings did not display any kind of exceptional ability. We normally imagine those who achieve great things in the world as somehow possessing a larger brain or some innate talent, giving them the raw materials out of which they can transform themselves into geniuses and Masters. Based on my research and thinking this did not seem to be the case at all. Instead, this intelligence came from the intensity of the desire to learn and the process they went through to develop high–level skill. I call this power “mastery” and I believe anyone can reach it by following these steps. All of us are born unique. This uniqueness is marked genetically in our DNA. We are a one-time phenomenon in the Universe — our exact genetic makeup has never occurred before nor will it ever be repeated. This uniqueness is manifested in early childhood by a primal attraction to some activity or form of learning — music, mechanical skills, sports, games of strategy, observing nature. There is no rational explanation for these childhood attractions. Such childhood interests spark our deepest curiosity but many of us lose touch with these inclinations. We listen to parents and peers; we choose career paths that promise comfort and money. Because we are not deeply connected to the subject or field we choose to pursue, we do not pay deep attention. Our learning and skill is not exceptional. Your task in life is to find a way to incorporate these primal inclinations in your career path, to reconnect with what makes you unique and genuinely excites you in life. You will find your calling by thinking back to your childhood, reflecting on these early interests that you may have strayed from. They may be several interests involving several skills. By developing these skills you can then combine them in unusual ways. For Leonardo da Vinci, his earliest inclinations were towards nature, capturing it on paper, and studying all forms of nature in a scientific manner. He developed deep skills in the arts and sciences and then combined them in a way that makes him completely unique, the preeminent master. You do not simply give up what you are doing and change course radically. You must find a way to channel the skills you have towards these deep interests. By following your inclinations, you will end up creating or discovering something unique, giving you the ultimate power in a world where the greatest career danger is that you are replaceable. Remember: the first move toward mastery is always inward — learning who you really are and reconnecting with that innate force. It is never too late to start this process. After discovering your Life’s Task, you enter the most critical phase in your life — a practical education known as The Apprenticeship. In the stories of the greatest Masters, past and present, we can inevitably detect a phase in their lives in which all of their future powers were in development, like the chrysalis of a butterfly. By looking at their various paths we can deduce an ideal apprenticeship that transcends their fields and indicates something essential about the brain and how we learn. Your first move is to look for places of work and positions that offer the greatest possibilities for learning. Practical knowledge is the ultimate commodity, and is what will pay you dividends for decades to come — far more than the paltry increase in pay you might receive at some seemingly lucrative position that offers fewer learning opportunities. This means that you move toward challenges that will toughen and improve you, where you will get the most objective feedback on your performance and progress. You do not choose apprenticeships that seem easy and comfortable. The great danger in the beginning is the temptation to try to gain attention, to prove yourself before you are ready. Instead you must take a step back — your goal is to transform yourself into a consummate observer. You learn the rules that prevail in your profession and the skills that are really necessary to rise from within. You find mentors who can instruct you best, their experience becoming yours. In the end, by observing, learning, and practicing you will gain the right kind of attention — you will be seen as someone who is serious and disciplined. In all fields, the key to ultimate success is acquiring as many skills as possible. This could be something physical such as operating tools or machines, or something more nebulous — the ability to research and organize information, or managing people. Whatever the case, at the outset, it is essential that you begin with one skill that you can master, and that serves as a foundation for acquiring others. If you take this far enough, you will naturally enter the cycle of accelerated returns: As you learn and gain skills you can begin to vary what you do, finding nuances that you can develop in the work. Elements become automatic and you can practice harder, which in turn brings greater skill and more pleasure. In the last step of the apprenticeship phase, you must make the move to a more active mode of experimentation. You find ways to take what you have learned and apply it in some way — a project you put your name on, for instance. In these first attempts at moving out on your own, you are looking for feedback from those above you and the public. You are apprenticing in the ability to handle criticism and developing a tough skin. You will know your apprenticeship is over when you feel you have nothing left to learn in this particular environment. Often the greatest obstacle to our pursuit of mastery comes from the emotional drain we experience in dealing with the resistance and manipulation of the people around us. We misread their intentions and react in ways that cause confusion or conflict. Social intelligence is the ability to see people in the most realistic light possible. The first step in acquiring social intelligence is to realize that you tend to project your own emotions on to other people, to see into them qualities that you want or need to see. It is only by being aware of how deeply you distort these perceptions that you can correct this naïve tendency. Social intelligence is a twofold process. First, you must learn to read people in the moment, seeing them as individuals and trying to gain an understanding of them from the inside out. Such empathy will prove invaluable in being able to persuade or seduce them. You gain this intuitive feel by cutting off your ego, the voice inside your head, and listening and observing more deeply. At the same time, you must accumulate knowledge on human nature, on the common traits and weaknesses that we all possess — such as envy, insecurity, laziness, passive aggression. With such knowledge you can avoid becoming the victim of the sharks in the water. Secondly, you must also learn how to see yourself as others see you, using them as a mirror to help correct your own social flaws. In the end, you must also be able to suffer fools gladly, to deal with the many incompetent and foolish people who will cross your path. Getting angry at people’s foolishness will needlessly drain you of energy and desire. Understand: navigating the social environment is a prerequisite — success attained without this intelligence is not true mastery, and will not last. As you accumulate more skills and internalize the rules that govern your field, your mind will want to become more active, seeking to use this knowledge in ways that are more suited to your inclinations. The key to awakening this creative energy is to maintain a fluid, open mind, one that is continually looking for connections between ideas and novel perspectives on problems. After a lengthy apprenticeship, the counter tendency is to become conservative with what you know, to follow the paths others have forged. You have to force yourself from this position, continually challenging your own assumptions and not being afraid of failure or the criticisms that will come from experimenting with what you have learned. You must be aware of the primary law of the creative dynamic — namely, the energy and excitement you put into your work will be translated into the final results. If you are primarily motivated by money or the need for attention, the public will read this into the work and they will be suitably unimpressed. If you feel a deep connection to what you are investigating or expressing, this will resonate with others and bring you much more money and attention in the long run. The endgame here is to mix your years of discipline and practice with a bold and original spirit. One without the other will lead you nowhere. Throughout history we read of Masters in every conceivable form of human endeavor describing a sensation of suddenly possessing heightened intellectual powers after years of immersion in their field. The great chess Master Bobby Fischer spoke of being able to think beyond the various moves of his pieces on the chessboard; after awhile he could see “fields of forces” that allowed him to anticipate the entire direction of the match. Albert Einstein suddenly was able to realize not just the answer to a problem, but a whole new way of looking at the universe, contained in a visual image he intuited. The inventor Thomas Edison spoke of a vision he had for illuminating an entire city with electric light, this complex system communicated to him through a single image. In all of these instances, these Masters experienced the power of intuition, or a fingertip feel. All of us have access to this higher form of intelligence, one that can allow us to see more of the world, to anticipate trends, to respond with speed and accuracy to any circumstance. This intelligence is cultivated by deeply immersing ourselves in a field of study and staying true to our inclinations, no matter how unconventional our approach might seem to others. The ability to have this intuitive grasp of the whole and feel this dynamic is simply a function of time. Since it has been shown that the brain is literally altered after approximately 10,000 hours of practice, these powers would be the result of a transformation that happens in the brain after some 20,000 hours and beyond. With this much practice and experience, all kinds of connections have been formed in the brain between different forms of knowledge. In moving through these various steps, with an intense energy, you must have faith that these intuitive powers will come to you over time. The ability to sense the overall dynamic in any situation, to foresee problems and solutions before anyone else will bring you to the heights of power. The path to mastery is relatively simple. The first move is the most important: follow a career route that is matched to your inclinations and interests. Develop skills in as many areas related to this interest as possible. Work with mentors to streamline the process. Discipline yourself, gaining self–mastery. Learn how to work with people and defend yourself against the aggressors. Then, let time take its course. Creative energies will emerge, as will high–level intuition. There are no shortcuts; the path can take many years and involve numerous setbacks and detours. But in the end the payoff is immense. You are no longer replaceable. You are one of a kind, a Master of your field and of your destiny. Robert Greene is the bestselling author of The 48 Laws of Power (two million copies sold) and The 50th Law with 50 Cent. 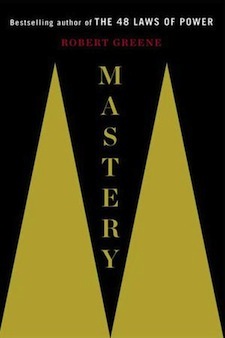 His latest book, Mastery is being released November 13, 2012. Check out Robert's blog at Power, Seduction and War. The first thing that came to my mind was the famous book, Think And Grow Rich, by Napoleon Hill. Many have heard of the book but not all know his story. It took him 25 YEARS to write it, after inetrviewing thousands of highly succesful business men and thought leaders. Probably far more than 10,000 hours went into it. His mastery came from a very long apprenticeship with many great mentors. But imagine writing a book during the Great Depression about obtaining wealth and power through developing a new thought process. How positively iconoclastic at a time where people were dreaming of just having a job and putting food on the table. Yet it became one of the most recognized and successful books of all time. This post is a great example of how to forge your unique place in the world. Great way to start off a Monday! it is sort of synchronicity because I wrote a small article about going inside to start the path of mastery as well. Thanks for your insights and I am looking forward to reading your book. I love number 4: Awaken Creative Energy! It’s so important to love what you do as this will really help you come alive when you work on your projects. Loving what you do means that you’ll leaner it very quickly and your mind will be continuously thinking of the best ways to implement it into something! Great Read, really enjoyed that! OMG! This is really Robert Greene on Copyblogger. First of all let me tell you that I am a great fan of yours and have read the 48 laws around 3 times and often quote from it. Mastery as you say truly resides in that experienced eye which only comes after a time and is able to pick the faintest arenas in one’s trade. Napolean Hill’s is a great book in that it teaches you to be resilient, after all, if you fall at the first hurdle and don’t get back on the horse, how will you ever succeed? To be successful I’m a firm believer that you have to love the industry you work in otherwise it’s just a job – if you love golf – work in the golf industry – you’ll enjoy going to work everyday and your passion will be there for all to see! I, without a shadow of doubt, agree with the process it takes to achieve mastery simply because everything that I have ever become proficient at, started with an insatiable desire to be better. It is the same path I am now taking to become a master at content marketing/writing and one that I believe is not to far away. There are undoubtedly many misconceptions on the foundation it takes to build from in order to excel but I have come from a broken home of mediocre income and that has been a driving force for most of my achievements. I too look forward to reading your book for any other strategies to further advance myself. Thanks for this. I find “Step 3: Gain Social Intelligence” the hardest one to master. I also think it can be the most valuable step in this process. I agree that, without social intelligence, much of a person’s talent is wasted, either in lost potential or time spent dealing with stressful, and sometimes painful, personnel issues. Though it’s important for people in any line of work to develop a thick skin, the pursuit of understanding and respecting the subtleties of human behavior is just as, if not more, important and extremely difficult. I also feel that gaining social intelligence can be incredibly rewarding. The ability to solve a problem, I think, is more valuable than simply being able to ignore or sidestep that same problem. I think the pursuit of social intelligence doesn’t make us softer. Rather, it makes us smarter. Thoroughly enjoyed (and still do) 48 Laws of Power. I look forward to this one. This book is getting added to my list. I have gotten a glimpse of what it’s like to see the big picture of how a given situation works. Truly amazing! Thank you for sharing. From what other commenters here have said, looks like I’m going to have to add 48 Laws of Power to my reading list! Thank you so much, Robert and CopyBlogger. I have read the first two books by Mr. Greene, and I can’t wait to read this as well. There’s been an increase in interest in this idea of “mastering” a subject through years of intensive work. I’ve read Outliers, but it seems Mastery is a more nuanced and fuller look at a very enticing subject. It’s been awhile since I’ve read something like this at CB. Powerful and so on point. Thank you for sharing this, Robert. Uh-huh, uh-huh, uh-huh, I agree with everything posted here because I’ve read the book. Please, tell me this is a re-issue of the book I know I read a handful of years ago and kept when I drastically downsized my library. Over the years, as books such as the Talent Code came to market, I dug through the boxes of books I kept looking for this one, thinking it would be easy to find because of the bold and distinctive cover. I never found it, so off to Amazon and B&N web sites looking for it. It wasn’t there, which made no sense because the book was so rich and spoke to me with such clarity. I even started a blog last year with no clear idea what I was writing about until a pattern showed itself–living and writing with bold, clean lines. When that became clear, I immediately recognized a seed this book had planted in my thinking. One small favor. Tell me this is an updated version of the book I so vividly remember reading and lost. Tell me it went out of print or something along those lines. If you can’t, then I’ve been recommending a book to people for years that was yet to be written, and that’s extremely uncomfortable. This is a wonderfully inspirational article, full of many truths. What Robert says about us so often drifting off from our unique path, due to outside influences, resonates particularly well – sadly, perhaps. Strangely though, I have found that certain elements of Mastery can be attained even in these instances, if you cast energy and commitment into the Pond, but it is fulfillment that wanes. One thing that Robert doesn’t explicitly raise, is the manner in which Mastery draws on both creativity and community – he does talk about about Social Intelligence, but I would suggest that there is more to community than just this : I believe that True Mastery would place you in a position where you not only occupy a commanding and an intuitive space in your subject area, but you are also able to draw on the creative energy of like-minded souls that perhaps see you as a sapiential mentor, and that in this sense you reach a point where it is through others that you are able to secure continual refreshment of both your field and self. Mastery may indeed be redundant, in the absence of social and community influence. I would be interested in other reader’s comments on this thought. Finally bought ‘Mastery’ on Kindle after “molesting” it in the book store. So far the intro is so chock full of goodness, I can’t get past my notes and analysis made within it. As per usual, likely another masterpiece from Mr. Green. I just read the book and realized that, this book is going to change my life, forever! I have read a couple of thousand books, and never was I more captivated by any other book, whatsoever! It’s a true gem and nothing can be comparable to this. Its actually ‘practically-inspiring’ and it makes you take actual action instead of some regular plain temprorary motivation, found everywhere else! Well, I am sure that you must have gone through another famous and truly acclaimed book by Malcom Gladwell, called : ‘Outliers’. Clearly, What this indicates is the fact that, although both these books have a somewhat similar context and subject ( and both are backed by strong historical data and deep research), still, there is a hell lot of difference between both their philosophies. Now, my question to Mr. Greene , would be : Where do you think Mr Gladwell missed the point and how can these differences be explained rationally and which one of the above view points do you consider absolutely essential to attain ‘mastery’ and be ‘successful’ ?